This year 2010, our Shangkala team, make some journey to Bali island. Our Shangkala team meet one of spiritual community in Bali. 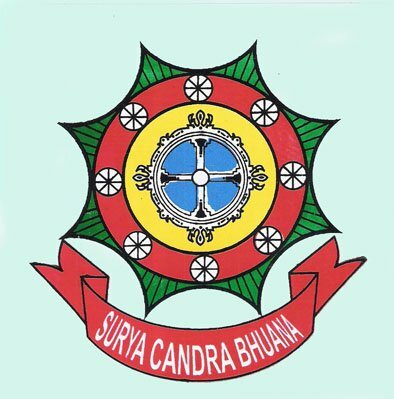 The name is Surya Candra Bhuana. We interest meeting them, because this is not only spiritual community, but also a school which registered in Culture and Education Ministry of Republic Indonesia. This community lead by Mr. I. B. Alit Kusumanegara. Since he was a child, he learn martial art. Than after finishing study, he move to Java island for worked. There he also learn martial art and spiritualism in many teachers. After that, he return home, Bali. He want to share what he have learn in live by form Surya Candra Bhuana. There he give the lessons of phisically martial art and also spiritualism. He formed this organisation since 70’s. 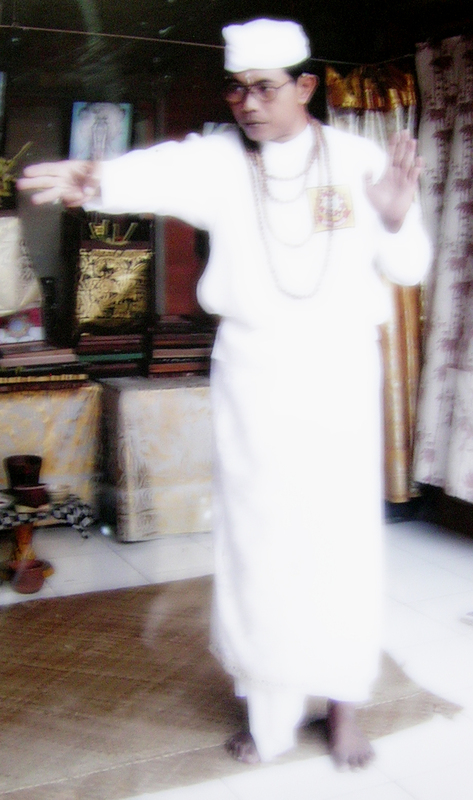 First he gave Bali pencak silat, a Baliness martial art. His pupils came from many areas in Bali. Then he developed the lesson and giving Baliness therapy and teached to anyone who want to learn. Also give some free energy Bali therapy routinely to many people needed. Than in latest 90’s by the help of his son, Bagus, they concern in Yoga school. So they made special yoga programs including Baliness taichi and Balinese therapy, as a whole healthiness of body, mind and spirit of authentic Bali. They are offering these programs to luxuries 5 stars hotels in Bali and private lessons also. Yoga meaning “union” Harmonize the mind, body and soul through exercise and breathing. When you are relaxed state, the oxygen level in your blood stream is higher and the body is balance. Yoga whether it is passive form (such as Hatha and spiritual yoga) or dynamic form (such as astanga, vinyasa or power yoga). Has the ability to tone and improve flexibility. Through different controlled movements you stretch, bend and twist breath more deeply, energize the body, release trapped nerves and expand your muscles. The various yoga postures as known as asanas. Our instructor will be able to advise you on different moves and technique to easy practice at home after back from Bali. Once you have perfected the moves, practice yoga daily to clear your mind and relieve tension in your body. Lets contact Us!! We will come to your hotel for private or come to our training place. 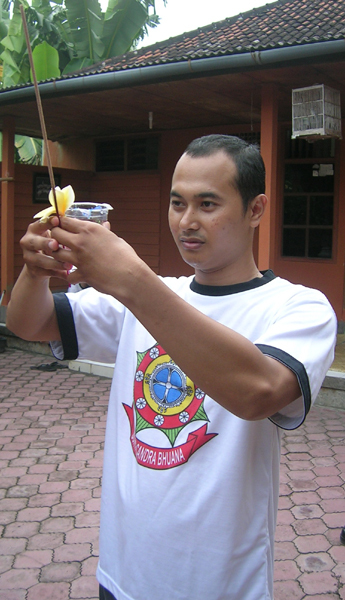 Bayu means power, suci means holly (nature), so bayu suci is spiritualism exercises as known as Tenaga dalam (inner power) by Balinese practices. That combines Balinese dance and some exercises technique to promote total well being. It has been proved regular practice of bayu suci relaxes and de – stresses the muscles and nervous system, boosts metabolism and enhances the power of the immune system. It also improves posture, flexibility and circulation. 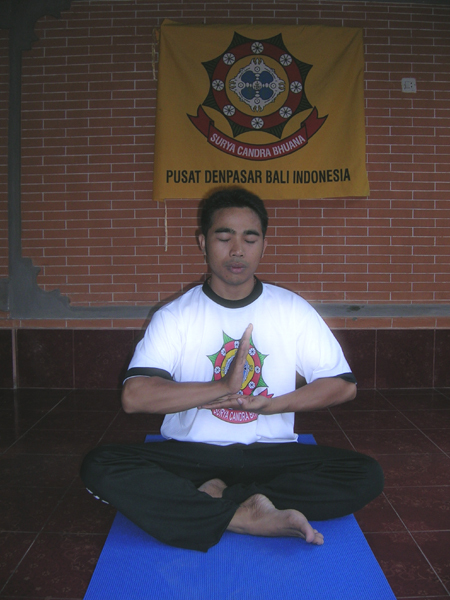 Bayu suci involves following as series of slow movements: 7 of them in the shorter sequence takes about 60 minutes to complete this exercise. Our instructor will repeat the exercises until you remember. And 12 movements in the longer sequence. These movements help balance the flow of energy (chi) within the body. In Bali it is to practice Bayu Suci outdoors, especially on the beach area, in order to absorb the energy emitted by universal. To find qualified Certificate come to join with us. Meditation is combination controlling of breathing, focus and concentration, energy movements to refresh your mind and body fell love happiness and intuition. If you lead stressful lifestyle, it is important to learn to switch off at the end of a busy day with therapies or practices that can easily be incorporated into your lifestyle. Never use lack of time as an excuse to prevent yourself from meditating. Make the time one of the most effective ways to manage stress is thoughts the age – old practice of meditation. It focuses your thought and is a great way to calm your mind and body. There are many different movements technique of meditation such as Giri Bhuana (health meditation), Samadhi (enlightment / peace, love, happiness meditation), cakra meditation, creative visualization meditation and kundalini. Some of which are best taught by an expert. Try to following some of technique meditation with our qualified instructor and absorb right thought energy to your body and try to routine practice the technique into your daily life. Energy movements part of meditation motion / standing power meditation. By ten (10) of longest sequences energy movement will create energy body protector for your body. This exercise more strength and power full. To absorb 10 direction universal energy to the body by controlling breathing and movements, it’s recommended to any people, any age and flexible or not. Our instructor will lead you step by step of movements and try to continue the program until you understand and can practice this exercise after back to home as one of different souvenir from Bali. Let’s joins with us get the certificate and feel the universal energy. Earth and Sky Salutation developing programs between yoga and energy flow, with some exercise for stretch, strength and flexibility. Absorb the energy from the earth and the sky with some flow technique exercises. This is exercise good for Balancing hot energy and cold energy in your body. It recommended for people have any problem. It creates by famous Balinese people who has Energy spiritual School in Bali and have been developing his method with local people and some foreigner. Let reserve the program and feel the sensation. Every country, every nation has special culture for self defense and some of them very famous in the world as self defense sport. Such as Japan with karate, Brazil is famous with capoera, Thailand with Thai boxing and China with Bruce lee kungfu and many more. In Bali we have special self defense as we know by the name Pencak Silat (martial arts). Pencak Silat is developing by combine culture, dance and self defense Bali such as boxing, kicking, and defense movements reflect. Learn the basic skill of Balinese self defense with our qualified instructor and fell the sensation indigenous of Balinese culture. Breathing exercise is how you can controlling of your breathing to many some function such as for refreshing your body (sitali respiration), controlling of your eating (sitkari respiration), balancing of hot and cold energy in your body (ida and pinggala respiration), So ham respiration (for warm your body), kapalbhati respiration. Soul blessing is a Balinesse ritual treatment we call by name Melukat. When people need peace and happiness in their live, have problem with illness, and for purification. this treatment we combine and develop with other ritual, first we will doing technique of concentration, controlling of breathing and doing basic of meditation to connect the light and bright and absorb the universal energy for love and happiness, and continue with clear the body and spirit with pure holly water (with young coconut water, sea water, river water, lemon grass, lotus petals flower, rose petals, and some many flower with one place), third continue with initiation program by the teacher (Guru) and consultation with teacher about the spiritual, life problem and many more. Follow this ritual treatment and feel the energy to calm your body, spirit and mind.